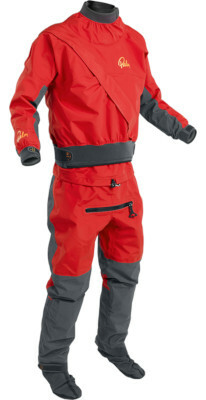 The Cascade is a great all round dry suit with easy entry thanks to its front TiZip. It's a great price as well but still has all the features you want like relief zip, twin waist & socks. The Palm Cascade is an excellent multipurpose drysuit with no skimping on features‚ diagonal TiZip front-entry allows easy closure‚ relief zipper‚ double taped socks and reinforced areas as standard‚ this suit will keep you comfortable and dry for all sorts of watersports activities. This is a must have suit for those who paddle alone or just want it to be easy to get in an out of their suit with asssitance. Popular for sea kayaking, touring and kayak fishing. Keep having fun in the colder months by keeping dry and warm. A performance 3-layer fabric that is supple, durable, highly waterproof & breathable. Breathability tested by the A1 method. Pressure tested to 500 mbar, these zips are watertight but flexible, making them more comfortable and easier to operate than brass coil zips. Made from thermoplastic polyurethane with extra strong plastic zipper teeth. A stretchy natural rubber neck gasket inside the collar minimises water ingress, keeping the inside of the garment largely dry even when fully immersed underwater. We offer a delivery service for the Palm Cascade Dry Suit to home and work addresses throughout England, Wales, Scotland, Northern Ireland & Ireland. Buy a Palm Cascade Dry Suit online from our website and collect from our store in Newhaven, East Sussex or from any branch within the Canoe Shops Group. There is no cost associated with this*. If you need any further information or advice about the Palm Cascade Dry Suit, please contact us and we'll be glad to help.